Cara Delevingne starred in Volkswagen’s world première of its T-Cross compact crossover SUV, a new model that slots under the T-Roc. 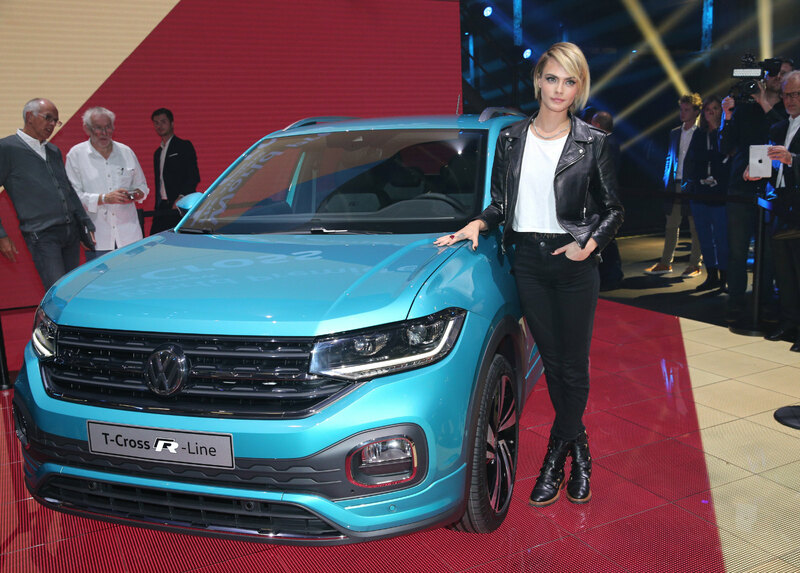 Delevingne—whom Volkswagen notes has 41 million Instagram followers—presented the new vehicle at the Amsterdam launch, which followed an earlier event in Shanghai and preceded one in São Paulo, all within hours of each other. They represent Volkswagen’s main markets: China, where Volkswagen has a major presence and two important joint ventures; continental Europe, where it began; and Brazil, where the brand continues to be a market leader. Joining Delevingne in Amsterdam were Volkswagen COO Ralf Brandstätter, chief designer Klaus Bischoff, and Andreas Krüger, who manages the brand’s ‘Small’ product line. Guests included Instagrammer Anna Maria Damm (1·3 million followers) and her sister Katharina Damm, and celebrities including Adrienne Koleszár, Florian Liebig, Jessica Cunningham, Vincent Cerutti, Hans-Joachim Stuck, Leslie Mándoki, and Ischtar Isik. The SUV market shows no signs of diminishing, and Volkswagen had been keen to extend its portfolio downward into the B-segment. T-Cross measures 4·11 m in length, with a 2·56 m wheelbase, with two one-litre three-cylinder engines (95 PS and 115 PS) at the entry level, and a 1·5 four-cylinder (150 PS) at the top. There is also a 1·6 turbodiesel (95 PS). Volkswagen stresses all the engines comply with the Euro 6d-Temp emission standard. Technical highlights include some features normally reserved for larger vehicles, including pedestrian monitoring with an emergency braking system, lane-keep assist, blind spot detection with rear traffic alert, inductive charging for cellphones, and up to four USB ports. Adaptive cruise control and park assist are optional extras. Production of the T-Cross takes place at Navarra, Spain, along with China and South America. T-Cross joins the T-Roc, Tiguan, Atlas (called Teramont in China) and Touareg in the Volkswagen SUV line-up.